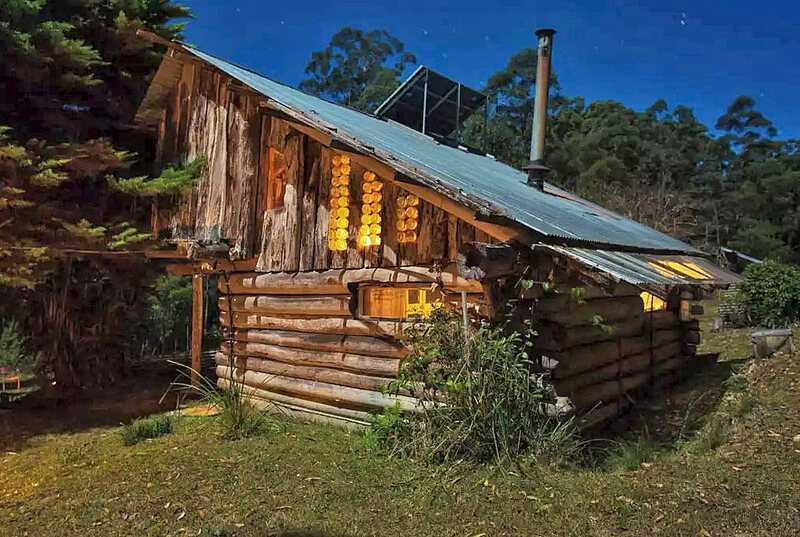 Enjoy the tranquillity and beauty of northern New South Wales mild temperate rainforest and relax in our rustic and remote eco cabin situation on 120 acres of land and including a private waterfall for swimming and plenty of nature walks and outdoor activities to enjoy. Suitable for couples, small family with 1 -2 children, or one person. There is an open-able futon downstairs for one or two extra people (max 6 in cabin). For events (such as yoga weekends, small weddings etc) and tenting for extra people - there is space around cabin for tents; please note, each person in each tent is added as an extra guest and incurs a nightly fee of $15 per extra guest. The cabin is on our property located 1 hours drive from Coffs Harbour and is at the end of a long road so you get to enjoy the quiet relaxation of seclusion and peace. The house is about a 5 minute walk from the cabin but you have complete privacy and access to the amazing waterfall and swimming hole. The cabin is completely eco with an outdoor composting loo, rain water tank, solar power and even recycled bottles for the wall! It was originally built over 50 years ago by a European gentleman and is built mainly from hardwood logs found on the property. 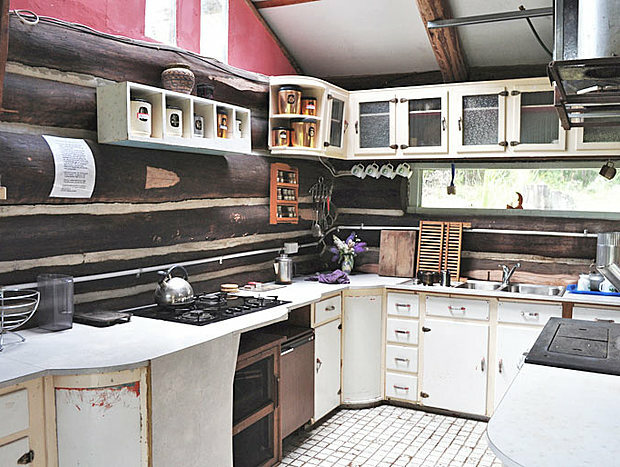 It is rustic, romantic and completely unique. It has a full kitchen and internal shower (as well as external cold one for hot summers days), full gas cook top, lounge area and mezzanine loft bedroom, and a brand new wood stove for cooking and heating in the cooler months. There is one queen-size bed and 2 single bed upstairs in the loft area and also a double futon bed in the lounge room area. So it's perfect for a couple or a small family of 1 or 2 children, or one person. We can cater for small groups - plenty of area to pitch a tent. We can also provide a tent. If you are looking for a weekend retreat or extended relaxation stay then we can cater to your needs. We have had writers, poets and meditators along with couples looking for a romantic weekend away or families wanting to get back to nature without having to give up electricity and other mod cons. We even have an outdoor bath tub that you can light a fire underneath to heat up the water, lie back and watch the hundreds of thousands of stars overhead! (NB: half fill bath with water before lighting fire underneath). If you don't have a car we can arrange for airport or train station pick up and transfer to the property for a small fee ($25), although it would need to fit into our schedule. Bed linen provided. I can provide towels. Remedial massage and Naturopathic consults / health assessments available with experienced and qualified practitioners. Please let us know before you come if you want a massage or a consult, so we can arrange a time when we are available. Relax around a pit fire in front of the cabin, or just sit and watch the wildlife as it unfolds in front of you. Have a hot bath in the tub and watch the stars with a glass of wine. Cycle around the tracks or along the road. Guests have access to the whole cabin, outdoor loo, tracks, waterfall, the river, lake, use of boat on lake, and can look around our garden stocked with herbs, edible plants, veggie garden and orchard. We can provide greens and vegetables, whatever is available plus fresh eggs from the chooks (if they are laying). You can have any of the greens or veggies available in the garden in front of cabin. Whereas we respect guests desire for privacy, we often invite people over for a coffee or drink on our balcony and we are happy to chat with guests as they wish. We are also happy to show them round our garden and share anything they have forgotten to bring or need. However, we are not always at the property so its subject to our availability. Composting Toilet: Toilet is an outside composting drop loo. Use a little chaff and lime for No 2s, down the hatch. No 1 doesn't need any composting. It's okay to pee on the grass. Directions: Its preferable to follow my directions available when you book, however, the GPS will work until at least half way down Camp Creek Road. No Pets: No dogs or pets. Solar Power: Care to be taken with power system - it is small with batteries and inverter, and not equipped to cope with long laptop use or multiple mobile phone charging or appliances with elements, which draw too much power. Bath: half fill with water first before lighting fire underneath, otherwise it will cook the enamel and leave a big hole. No smoking: inside or near the cabin vicinity. There is a table and chairs under a tree in front of cabin where you can smoke if you need to. Swim in the amazing waterfall area or anywhere up the Little Nymboida River fronting our property, sit under the waterfall for an amazing water massage. 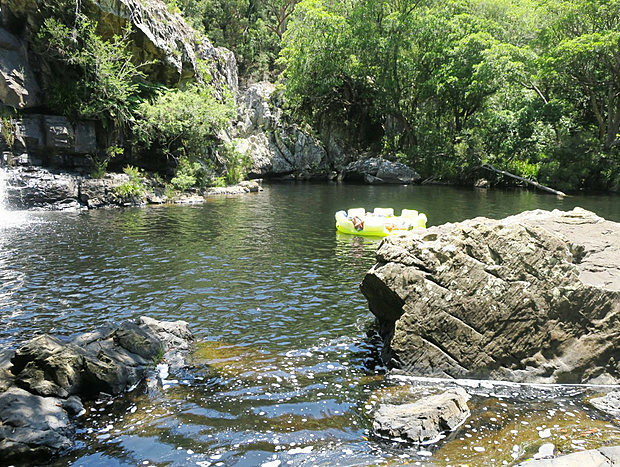 Climb the rocks, sit behind the waterfall (if you are game) or walk along the several tracks which lead to a creek or river and explore. Fish in the river. Meditate on the rock at the top of the waterfall and view the valley. Exactly what we needed to escape the busy work life. Judy and Andrew are amazing friendly and welcoming hosts who make sure you get the most out of your stay at the cabin. The cabin is makes you feel like you are travelling back in time and is definitely worth a visit! The waterfall nearby did not disappoint either. It was much bigger and more amazing than we had pictured.